'A Wrinkle In Time' Will Move You With Its Wisdom — And A Giant, Glowing Oprah Director Ava DuVernay's adaptation of the classic novel is devoid of cynicism, full of beautiful images and deeply moving. 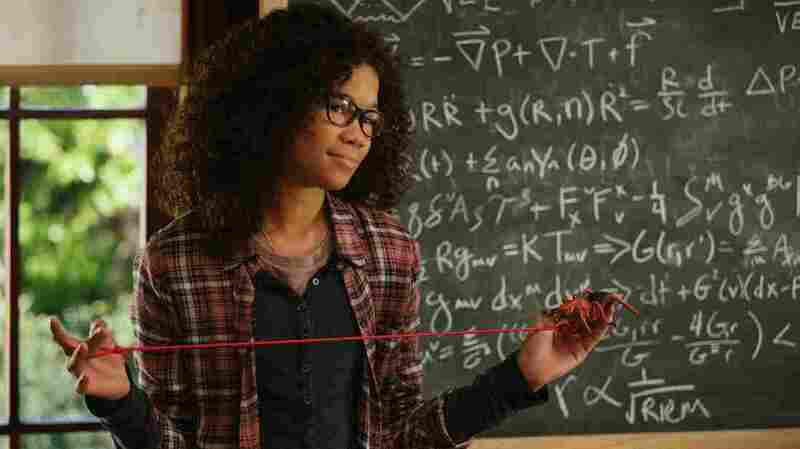 Storm Reid is Meg Murry in A Wrinkle In Time. Is that cynicism? Perhaps, but it's cynicism that is earned. What Ava DuVernay's adaptation of A Wrinkle In Time asks is that this cynicism be temporarily laid down so that you can, in fact, be deeply moved by wisdom delivered by a giant, glowing Oprah. If you do, it's a profoundly satisfying, imaginative and beautiful film. Adapted from Madeleine L'Engle's classic novel by screenwriters Jennifer Lee and Jeff Stockwell, A Wrinkle In Time is about Meg Murry (Storm Reid), who is called — in the sense of the classic hero's journey — along with her younger brother Charles Wallace (Deric McCabe) and her new friend Calvin (Levi Miller), to go in search of her missing scientist father (Chris Pine), who vanished while investigating the possibility of traveling through the universe. Helping Meg and her party are three strange and grand women: the chattery Mrs. Whatsit (Reese Witherspoon), the nearly wordless Mrs. Who (Mindy Kaling) and the greatest Mrs. of all, Mrs. Which (Oprah Winfrey). There are few contemporary directors who have been more willing to explore profound social wounds than DuVernay. In both Selma and especially the documentary 13th, she applies vigorous skepticism to American racial mythology and to the prison system that devastates so many. Here, though, you see a practiced skeptic and righteous visionary draw a clear distinction between forms: It is possible to believe in both unsparing interrogations of social practices and utter earnestness in art. A Wrinkle In Time, while willfully affecting and reliant on emotional resonance, does not rely on manipulative sentimentality, but on earned moments for its characters. And to the degree that depth of feeling in art is filtered through archness or wisecracking — even, or especially, in children's entertainment — this film is a repudiation of that idea. It supposes that it should be possible, despite everything, to be deeply moved by Oprah in the sky. That, at least for children, it's healthy to retain an ability to be thrilled by a display of that kind without embarrassment. That is not to say that the ideas at play in the movie are the only reasons to see it. As you might expect from a pricey Disney fantasy that takes place on different planets and in different dimensions, it's beautiful to look at, with an intentionally elevated unreality that helps gloss over the imperfections of computer animation. Colors rise and fall unendingly, not only in fantasy lands of mystifying creatures, but also on beaches and in front yards that are not as they seem. And in one late sequence, the film's commitment to Meg's visual ordinariness — filming and dressing her as a real junior-high girl of the type we've been told she is — pays off richly in her moment of freedom. The performances DuVernay gets from her young leads are impressive. Reid, as Meg, flits effortlessly between the plain talk of the teenager she is growing into at home and the woozy wonder of the child she still is. And McCabe does his job perfectly, which is to be supernaturally endearing and then supernaturally ... something else. And while the three glitter-eyed women who guide Meg on her way are elaborately dressed and filmed as goddesses, their performances are generous and focused: They are there to serve the story, and they don't dominate it. DuVernay's vision of the battle of good and evil is fundamentally humanist and hopeful, realistic but determined. While religious echoes are evident, the greatest good-doing in the story comes from people dependent on their connections to one another. At the screening I attended, DuVernay delivered a filmed introduction in which she talked not only about the film being a love story about childhood and the potential of children, but also about its appropriateness in "these divisive times." While A Wrinkle In Time never feels specifically topical or political, there are moments in which it seems to invite exploration of a kind of trust that is in very short supply in any divisive times, these included. Several of its emotional payoffs rely less on nobility than on faith in other people. As in any good hero's journey — and A Wrinkle In Time follows that formula quite faithfully — identifying allies and learning to work both in their presence and in their absence is critical. It's possible that you have to have been a certain kind of kid to feel the maximum effects of this story. It's possible that not everyone will experience, as I did, tears arising spontaneously in response not to either sadness or joy, but to truth, to the breaking open of emotional secrets. Tears not jerked, but loosed. It's possible that some of us who are Megs, some of us who waited too long to learn the lessons of Mrs. Which, Mrs. Whatsit and Mrs. Who, will feel things others won't. There are those who will not get past Sky Oprah. But for those who do, a rich film awaits.